The purpose of our Global Client Management function is to grow the client base and maximize the cross product opportunity within our largest clients, spanning multiple Frank Brands. We’re the client’s first interaction with Frank Recruitment Group, from the moment we receive a client’s email or call until their query is answered, we aim to deliver outstanding customer service, in turn leading to repeat business. As a result of the growth of our client base, and the demand for existing clients to be account managed, we’re looking to hire administration support. This role is crucial for the Client Management team to enable our relationship managers to be out visiting new and existing clients as much as possible, and you will be the front line support to our clients day-to-day. You will be in a high-profile position, offering you direct day-to-day contact with a variety of clients, as well as senior management across Frank Recruitment Group. You’ll be working across all our brands, liaising with all levels of seniority, both internally and externally. The ideal person for this role will have a passion for recruitment and relationship management, but perhaps looking to move away from cold calling or sales. You’ll value client partnerships, high-quality client care and be detail orientated. It’s a fast-paced environment where you’ll be working under pressure and client deadlines. 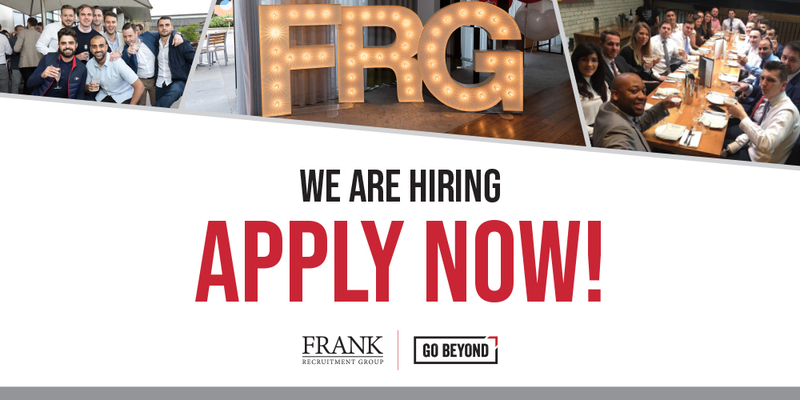 While undertaking your role you will be expected to be a brand ambassador for Frank Recruitment Group. You will need to provide clients with a level of customer service at all times; this will involve representing yourself as a credible, professional, industry expert that always gives accurate, informative and timely advice. Working with external clients and supporting internal Client Account Executives to co-ordinate role distribution, Resume Submittals and schedule candidate interviews. Manage client reporting and tracking on a daily, weekly and monthly basis. Engage and contribute towards all team targets and incentives.